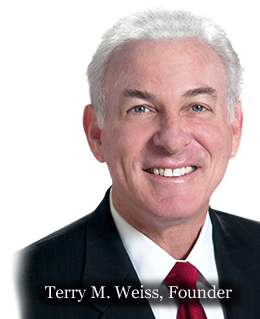 Weiss Law Search was established in 1978 by Terry M. Weiss. Terry is a Licensed California Attorney who resides in Orlando, Florida. After several years in private practice, Terry founded Weiss Law Search. Weiss Law Search has been responsible for the tremendous growth and success of numerous AmLaw 100 Law Firms and Fortune 500 Companies. Weiss Law Search is actively engaged in major cities throughout the world with special expertise in the US, China, and Eastern & Western Europe. Weiss Law Search is also actively engaged in China's Legal Community with Foster Weiss Executive Search. Weiss Law Search successfully developed and implemented the "Legal Marketing Group." This is a program designed for Attorneys looking to live and practice law in the city of their choice. Weiss Law Search is a “full-service” Legal Recruiting Firm. Our Mission is to provide the highest and best practices to our clients and candidates. By accomplishing our Mission, we will have assisted and advanced top performers in their respective careers and enriched the growth, production and economics of our clients.